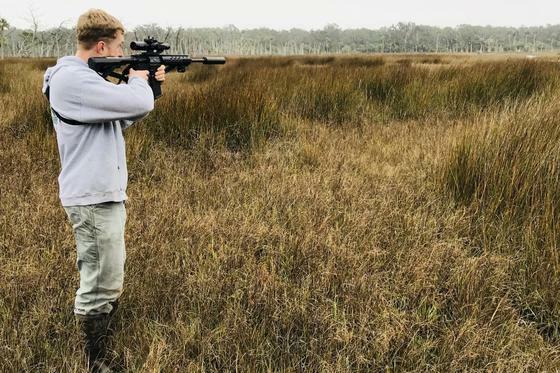 - "My job is to kill hogs"
Codey Elrod has a job most Southern hunters would kill for. Literally. And he gets paid for it. Elrod, a Georgia DNR technician, lives alone on Ossabaw Island. He works when he wants — daybreak, late afternoon, middle of the night. His office is the salt marshes, sandy beaches, maritime forests and cypress swamps that make up one of Georgia’s most beautiful sea islands. He is, officially, a “hog control technician” – the only full-time, government-paid wild hog hunter in the South. The specialness of his job owes to the rapaciousness of hogs. 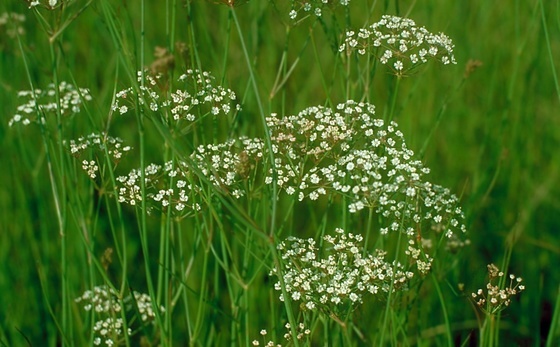 They’re a nasty, eat-everything, invasive species that is alien to Ossabaw and runs roughshod over flora and fauna. Dan Chapman is a public affairs specialist with the U.S. Fish and Wildlife Service. Consider this salamander SOS answered. 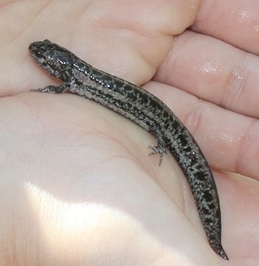 Thirty-seven reticulated flatwoods salamanders were released this month at Mayhaw Wildlife Management Area. The WMA near Colquitt is Georgia’s only known site for the endangered amphibians. 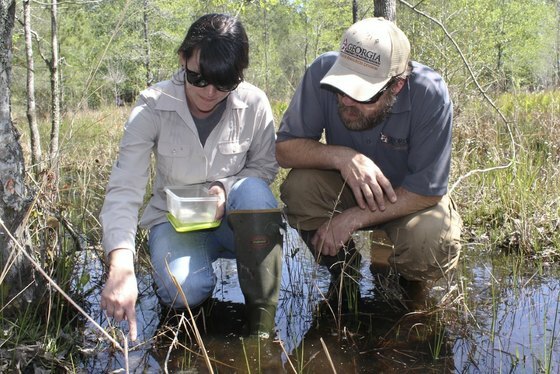 The salamanders were raised from eggs found in two wet-season ponds at Mayhaw in February. The ponds hadn’t filled with winter rains, putting the eggs at risk. The Joseph W. Jones Ecological Center at Ichauway reared the salamanders to metamorph stage. The release, done in stages, was Georgia’s first for the species using eggs collected in the state. It also marked a significant step for these young sallies, said DNR senior wildlife biologist John Jensen. Now it’s up to Mayhaw’s newest flatwoods salamanders to make the most of their rescue. Project partners included DNR’s Nongame and Game Management sections, the Jones Center and the Florida Fish and Wildlife Conservation Commission. Reticulated (and frosted) flatwoods salamanders breed and lay eggs in or on the edge of isolated wetlands. Adults live in burrows in pine flatwoods. Bad news for peregrine falcons nesting at Tallulah Gorge State Park: If any eyases hatched, it was likely during heavy rains followed by wind and cold in the middle of the month and none survived. The adults are no longer on the nest, Georgia's only known peregrine nest in a natural setting. Some good news: Ospreys nesting on camera at Skidaway Island have two young. Also, the eaglet at the Berry College bald eagle nest is testing its wings and balance in a pre-fledging behavior called branching. At age 11, Alston Li has an eye for owls. The Duluth sixth-grader’s portrait of a great horned owl was the grand-prize winner in DNR’s Youth Birding Competition T-shirt Art Contest (and the masthead for this newsletter issue). See all winners. The Youth Birding Competition itself starts at 5 p.m. Friday. Birding enthusiasts, from preK to high school ages, will scour the state to count as many species as possible before the 5 p.m. Saturday check-in at Charlie Elliott Wildlife Center in Mansfield. Check www.georgiawildlife.com Monday for results. 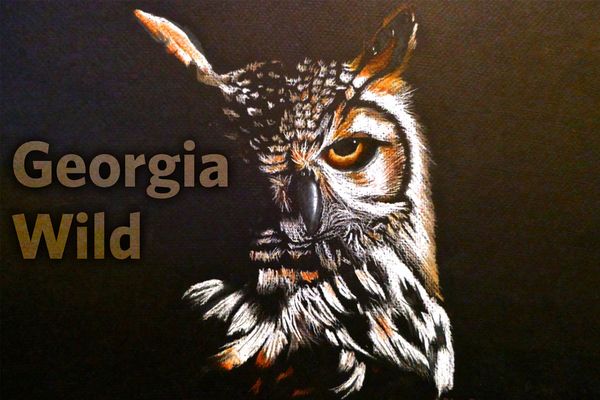 Johns Creek 18-year-old Rylan Kang not only won the Georgia Junior Duck Stamp Art Competition for the third straight year, she won this year’s national contest. The 2018-2019 junior duck stamp will feature her emperor goose painting. The Georgia Wild “Little Snakes” episode drew a crowd when reposted on DNR State Parks & Historic Sites Facebook page. In four days, it received more than 1,700 responses, almost 1,300 shares and more than 100,000 views. 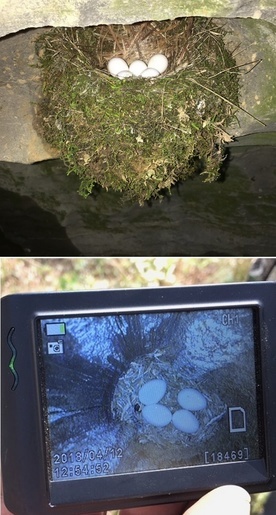 Unique nests: At top is an eastern phoebe nest and eggs that DNR senior wildlife biologist John Jensen found about 10 feet deep – and 10 inches above the waterline – in Anderson Springs Cave on Crockford-Pigeon Mountain Wildlife Management Area. Phoebe nests in caves and on banks and outcrops were more common before the birds began nesting on manmade structures such as buildings and bridges. On the bottom is the season's first red-cockaded woodpecker nest marked by wildlife biologist Joe Burnam. He "scoped" it April 12 at Silver Lake Wildlife Management Area near Bainbridge. Recent rains have primed areas for growing-season burns. While prescribed fire in spring can raise concerns about wild turkeys and other ground-nesting birds, research shows the benefits trump any negative impacts. With sea turtle and manatee sightings on the rise along Georgia’s coast, boaters should be on the lookout for these big and rare animals. Boat strikes are a leading cause of sea turtle strandings and manatee injuries and deaths. Names in the news: Eagle scouts Mark and Timothy Fievet gave a recent presentation at the DNR Board of Natural Resources meeting about their wildlife projects at Sweetwater Creek State Park. Mark built and installed 26 bat houses and Timothy created 45 artificial fish habitats at the Lithia Springs park. 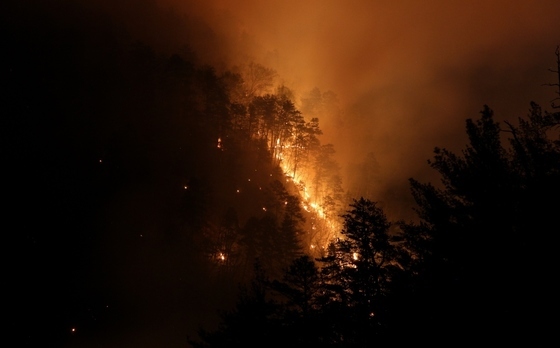 There’s fire in the gorge in this night photograph of a 1,300-acre controlled burn winding down at Tallulah Gorge State Park and on Chattahoochee National Forest and Georgia Power lands April 12. Partners included DNR, the U.S. Forest Service, Georgia Forestry Commission, Georgia Power and others. 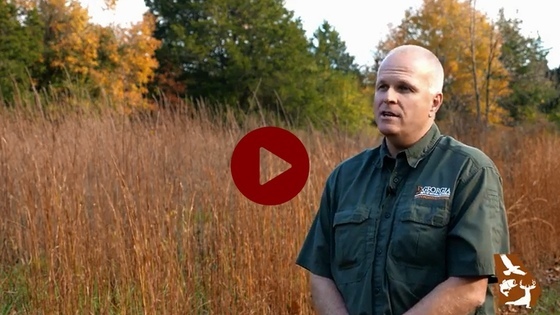 Watch: Before the burn interview with DNR’s Nathan Klaus. See Forest Service photos.